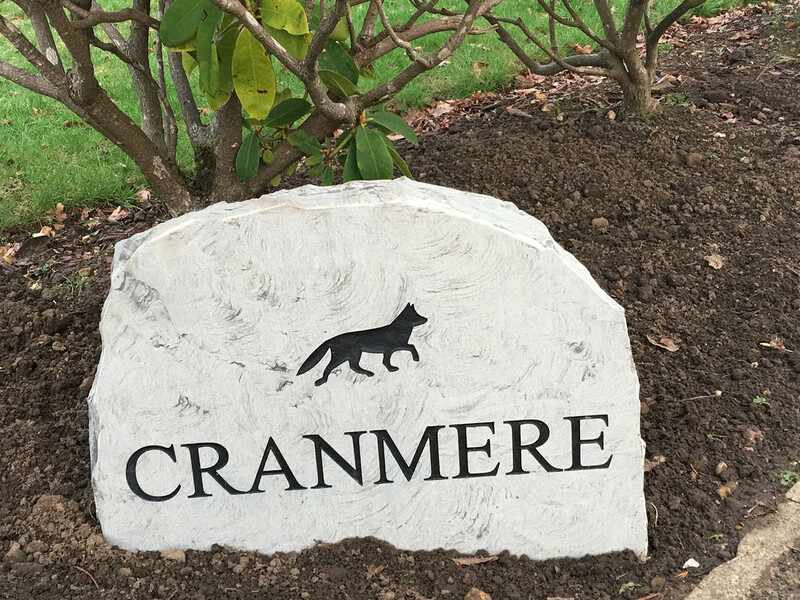 The team at Rustic Stone have been designing personalised house signs for properties of all sizes and ages for over a decade. 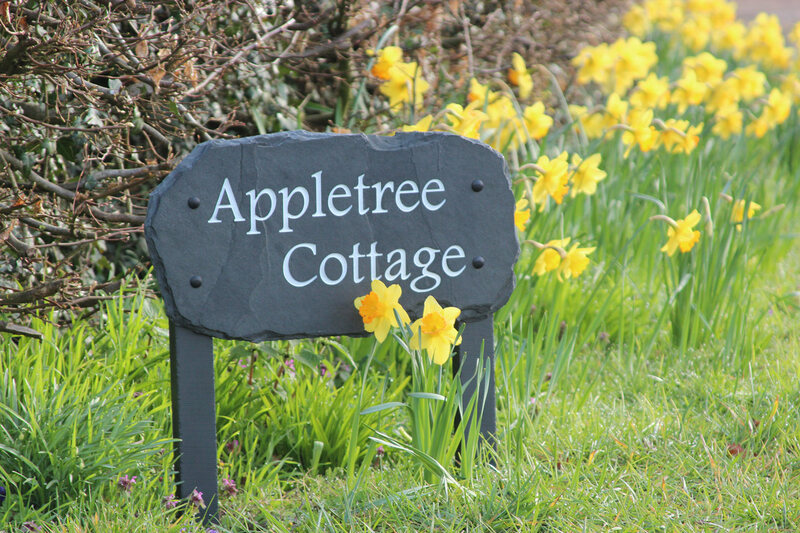 We use natural materials, hand-sourced in the UK to make our stone and slate house signs, setting us apart from our competitors. As a rapidly expanding family business, we focus on providing great service and value for money, and have thousands of satisfied customers. 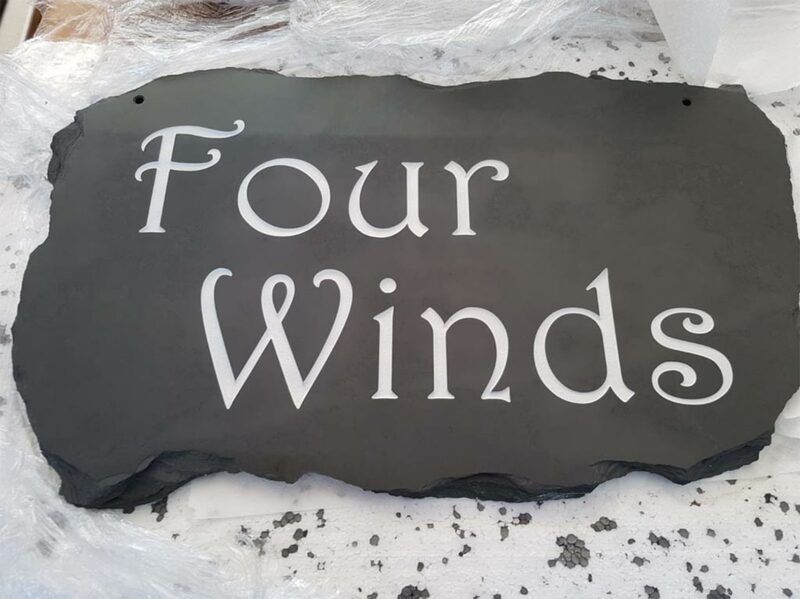 Our company vision has been kept simple since we started up back in 2001: we aim to provide high quality engraved stone and slate house signs, memorials and gifts. We are constantly striving to deliver excellent customer service and we love to hear what our customers have to say about our products and service. We have the experience not only to deliver a 1st class customer service, but also to provide you with a product that exceeds your expectations. Our prices are realistic and competitive, but don’t compromise on quality. 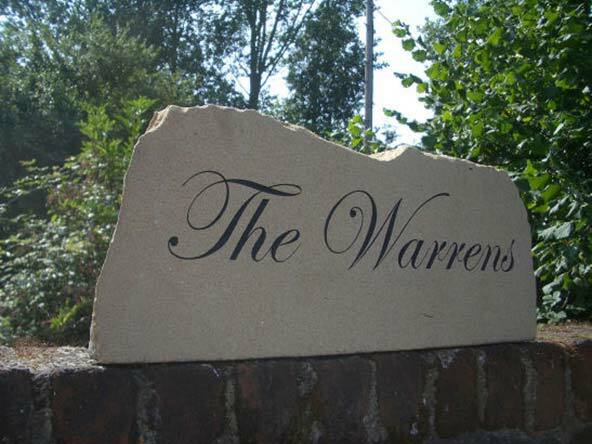 For a high quality stone or slate house sign that lasts, choose Rustic Stone. We use only the highest quality materials sourced here in the UK, which guarantees our products will stand the test of time. 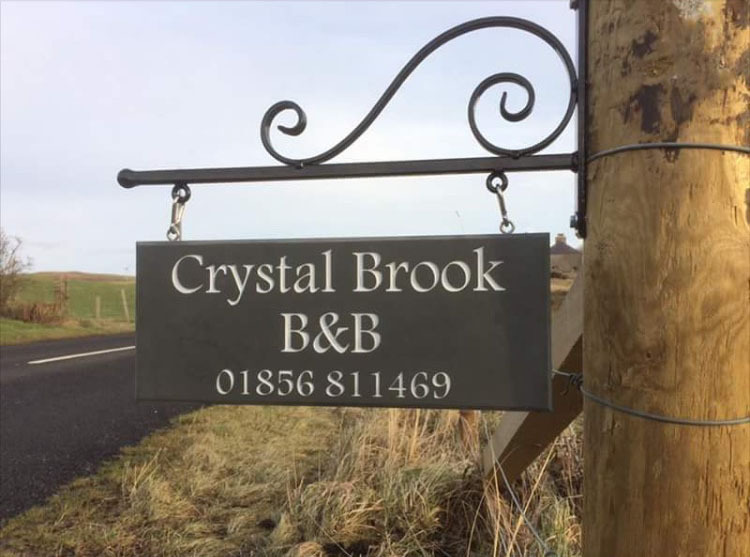 These types of signs are ideal for customers that want a house sign for a named property or if they wish for their address number to stand out more than just a plaque on a wall or side of a house. 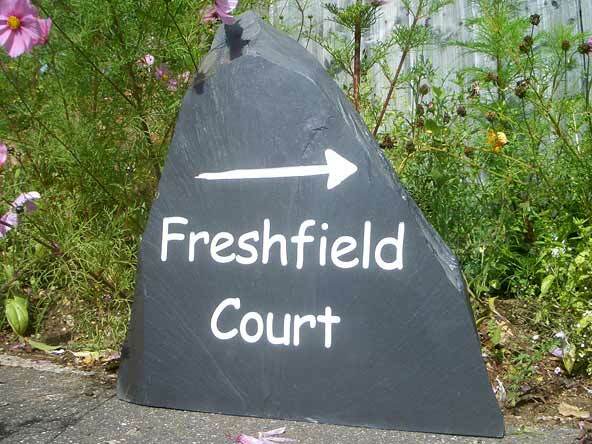 Our free standing signs are made out of slate or York stone and are superb for sitting on walls or just on the ground. 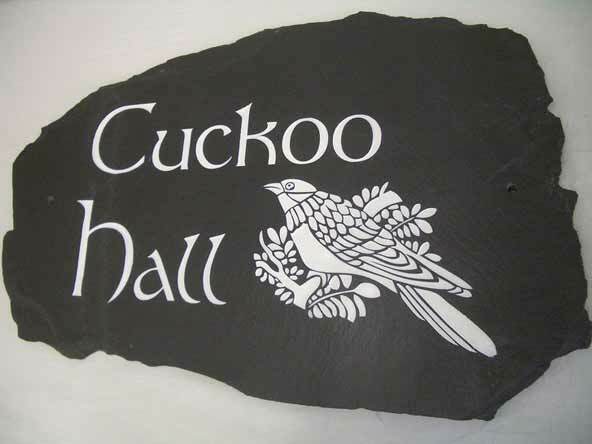 Our stone plaques and name plates are among our best selling products here at Rustic Stone. These stones tend to be popular due to their versatility and how well they work with so many different types of buildings. 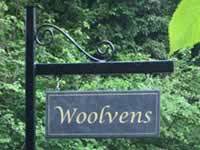 These signs are great for displaying deeply engraved house names, house numbers, or even for use outside of pubs and other businesses. 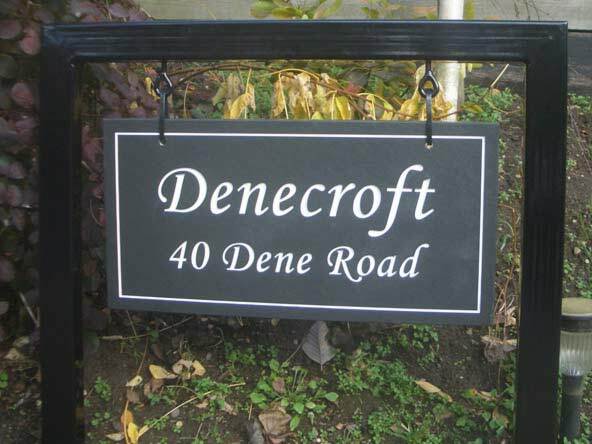 Our hanging house signs can really make your property stand out and are a popular choice among our clients with larger properties. All brackets have high quality powder coated finish, and are available as wall mounts or free standing frames. Double sided text available on all hanging signs. 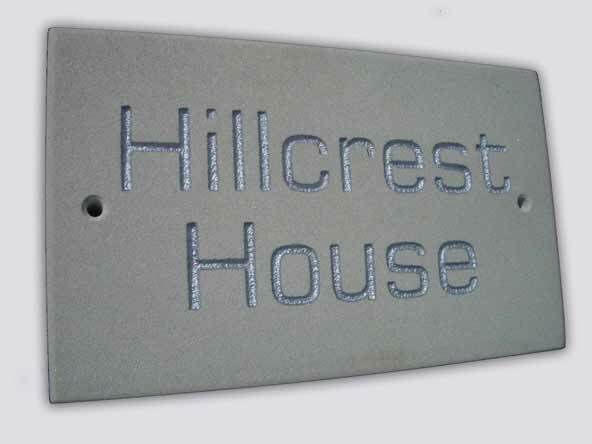 Our fantastic contemporary house sign designs are perfect for anyone wanting a high quality, modern look. Use our online design tool to see all the styles, fonts and designs available. We are very popular with businesses and commercial property owners across the UK. 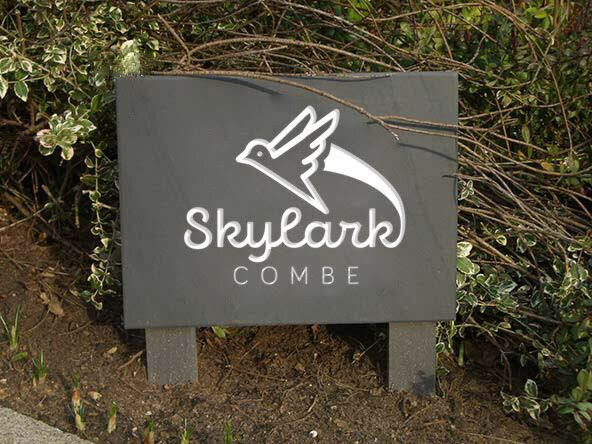 We often get asked for vintage or modern business signage and since slate and stone is very versatile we are able to easily provide both. 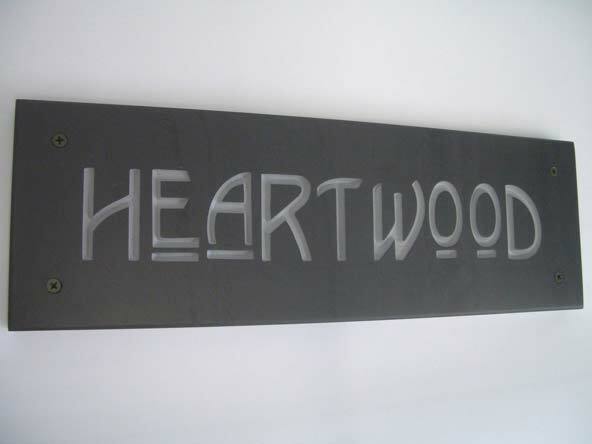 Our signs are fantastic and will work great any type of business, from outdoor small businesses to indoor enterprises. 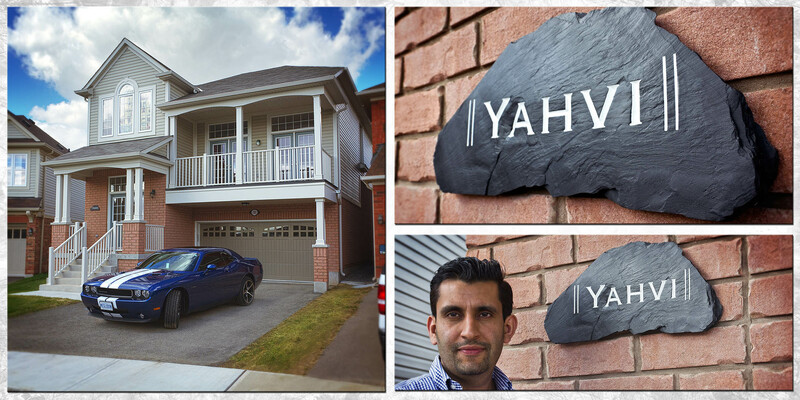 All of our house signs are custom made. 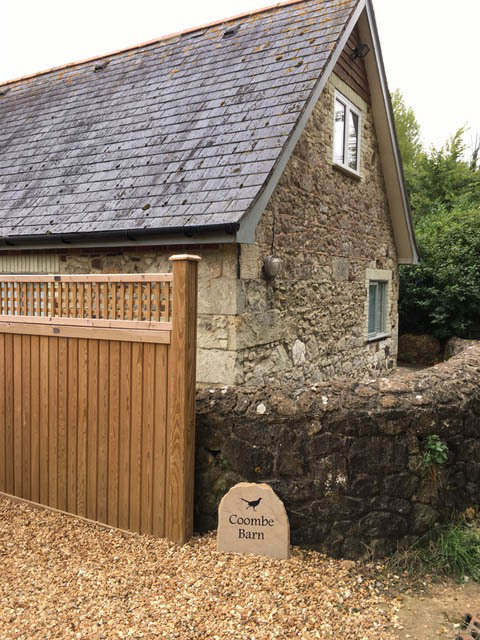 Our online Design & Buy tool is easy to use, containing dozens of pre-loaded images and fonts to help you create a bespoke sign for your property. It arrived well packaged and we were very impressed with the speed you made it. 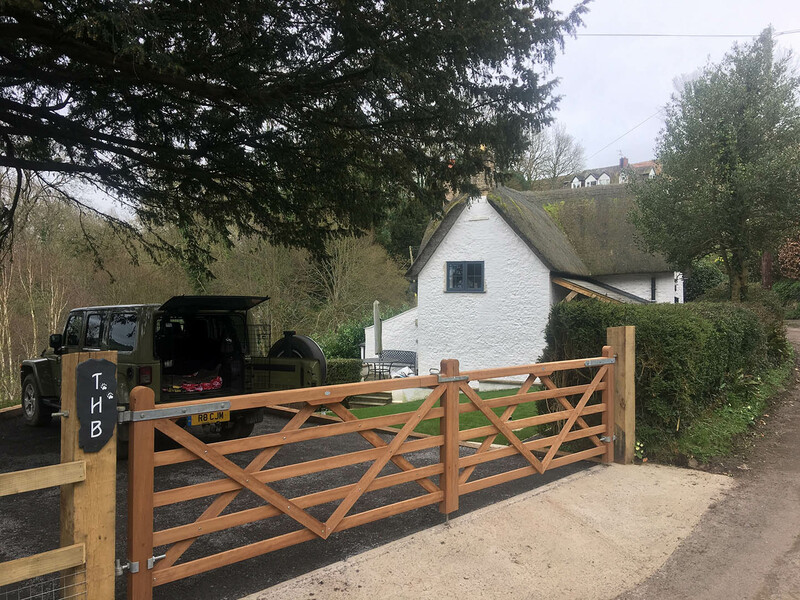 Five working days It looks wonderful outside our cottage, just the right size for people to see clearly from the road We were very pleased with the customer service. The sign was great quality and arrived solidly packed. Totally recommend Rustic Signs. I am very pleased with the house sign I ordered it is exactly what I wanted. The first sign was damaged in transit & was quickly replaced without question. I highly recommend Rustic Stone & will definitely be using the company again. Makes our house a home! Fantastic service great product really pleased. 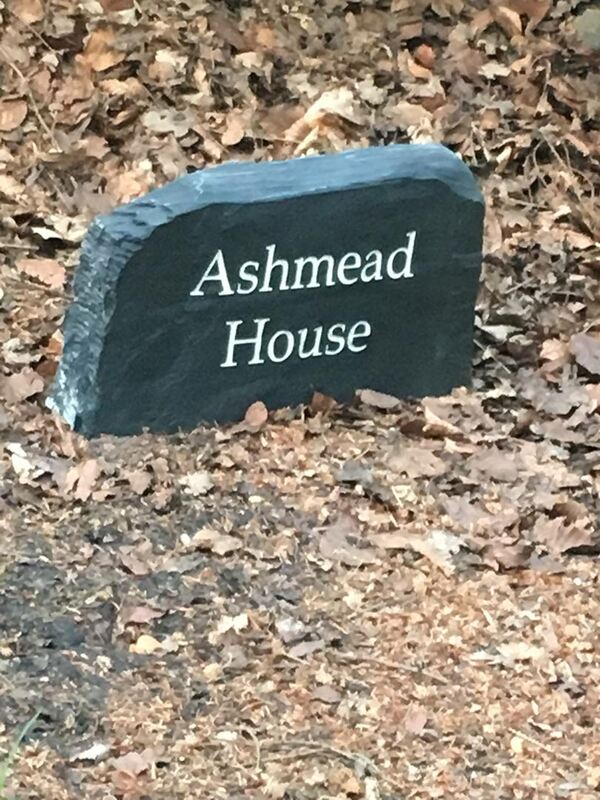 We are absolutely delighted with our new house sign. I had wanted a large slate sign and had been given very high quotes from other suppliers so I am really pleased that I continued to look. The service was excellent and being able to see the design before comitting was extremely helpful. Service was excellent with good communication. Sign came well packaged and now has pride of place at the front of my house. Couldn’t fault our experience with Rustic Stone. Fast and well wrapped delivery, help and advice when asked, and a brilliant product. Thanks so much. Lowest price I found, too! Really pleased with the service and my sign! The design process was the best I’ve found online, and communication from Rustic Stone was fantastic. Sign arrived in exactly the time the site stated, and is beautiful. Really really pleased, and would order from again! Thanks! 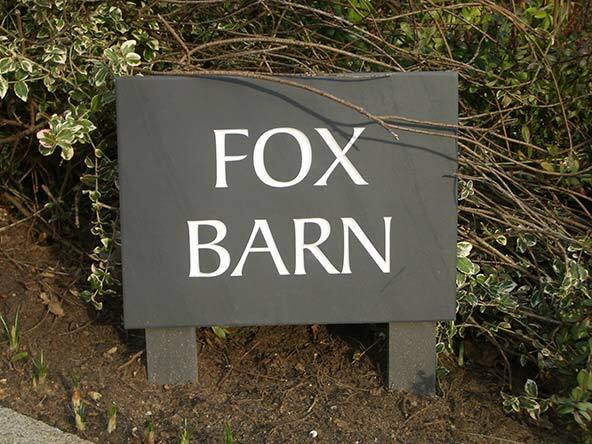 Lovely chunky stone sign, looks perfect outside our rural barn conversion (actually a former piggery!). Great communication, customer service and swift delivery at a very reasonable price, even to the Isle of Wight. Absolutely fantastic service quality Would definitely recommend. Very helpful and professional ensuring that our hanging house sign specifications were what we requested. The finished product exceeded our expectations and is beautiful and well made and the service is fast and efficient, thank you! Had no issues with this company, especially when my first order got lost by the courier company. Rustic Stones replaced the order promptly and it arrived a week later. So happy with my purchase and suits my house. Definitely would use this company again. Having just received my sign, I wanted to thank you very much for the truly excellent service and the quality of your product. The whole process was handled in a highly professional manner and my sign was delivered, well protected and on time. Great service from this company and highly recommended. 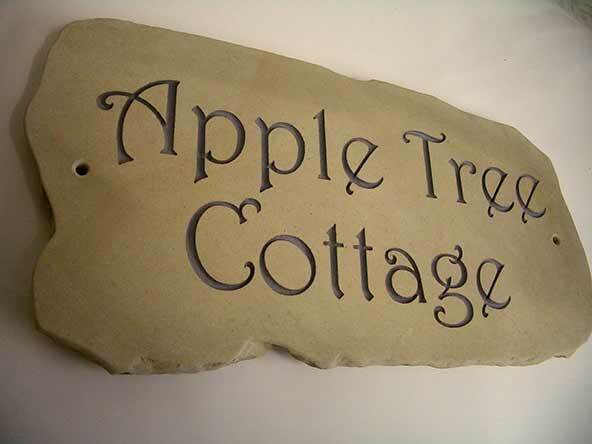 I placed an order with Rustic Stone for a slightly unusual sandstone plaque for the gate of our apple orchard incorporating both an image and text. It involved a flurry of emails which were promptly and helpfully answered. The plaque arrived today and it very lovely indeed. I highly recommend the service and craftsmanship of this company. Spoke to the office, they understood the brief and worked to tight time scales, the end product looks really great in situ. 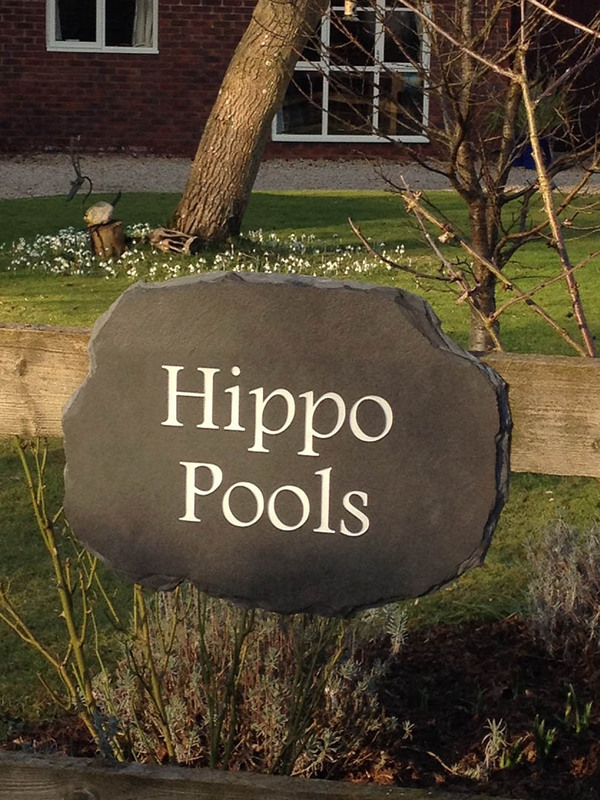 Rustic Stone was very helpful in changing our design and we were very pleased with the sign when it arrived. Extremely happy with the sign and service received. Top quality service and friendly staff as well as fast delivery. Given as a Christmas gift and grandparents are very pleased with it. Would recommend this website. Received excellent service. Good communication and prompt careful consideration to our requirements. Product arrived on time in fully protective packaging and was exactly as requested. Thought it looked a bit big until it was hung up and then it seemed just perfect. Could not have asked for better. 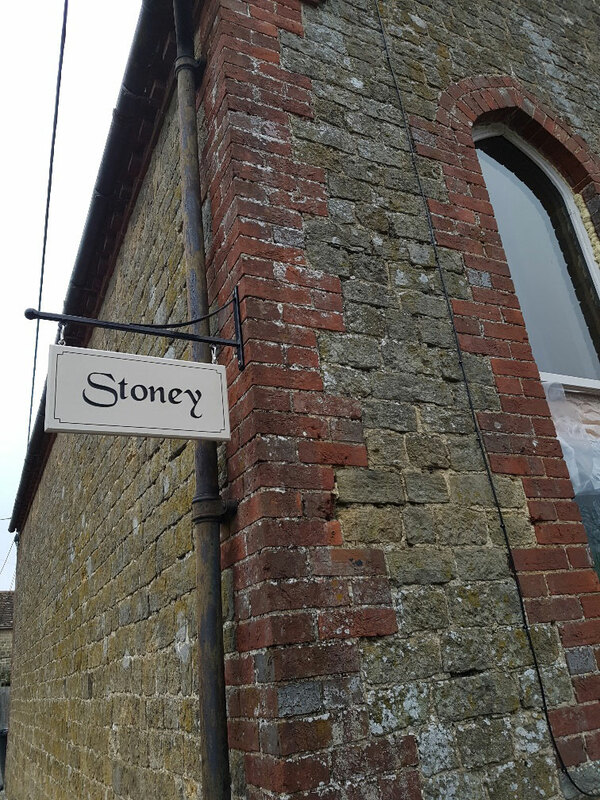 Thrilled with the hanging sign and the stone exactly matched our old building. Thoroughly recommend this company in every respect. Well done Jeremy and Rustic Stone, many thanks. We purchased a house sign just prior to the festive period for our new self build project, we wanted it to match an existing sign we had made over 10 years previously including the same letter sizing/colour etc. 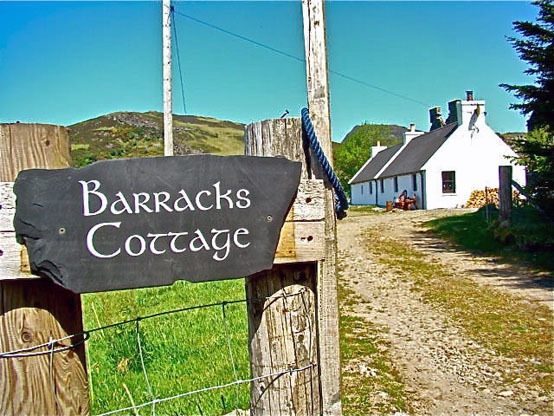 Great communication from Jeremy & the team and the sign arrived less than five days from placing an order to our address in rural Aberdeenshire – excellent service & workmanship & very highly recommended. I love the sign recently made for me. 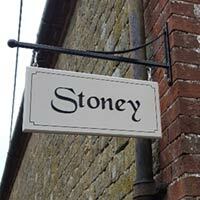 It is lovely sandstone with beautiful clear letters. Delivery was prompt. What an amazing service from beginning to end. 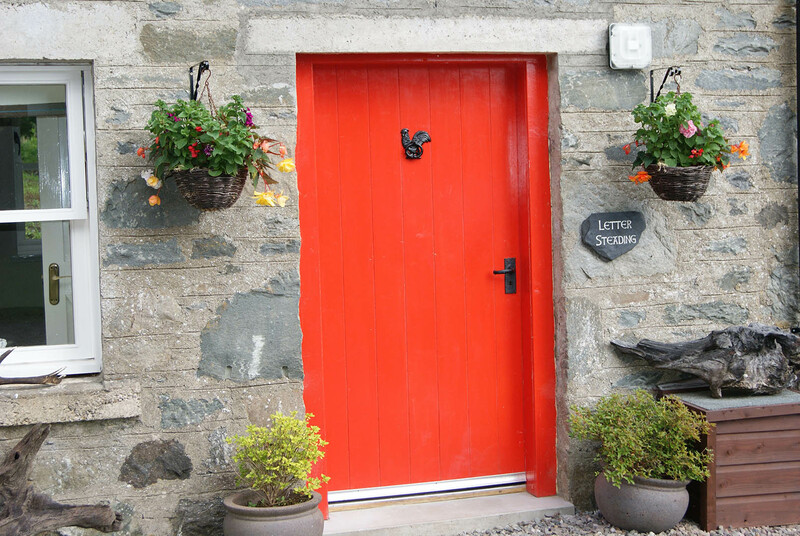 We had a little mix up with regards to delivery but having changed the house name it was totally understandable and rectified immediately with our signs being redirected to another address. I must mention a gentleman named Jeremy, his response time to queries was amazing. It was such a refreshing change to get this kind of service. Our new signs are now in situ and we absolutely love them. We would highly recommend Rustic Stone and will definitely be using them again when we finish our build. I scoured the internet (for days) looking for that special something when we named our newly bought home. 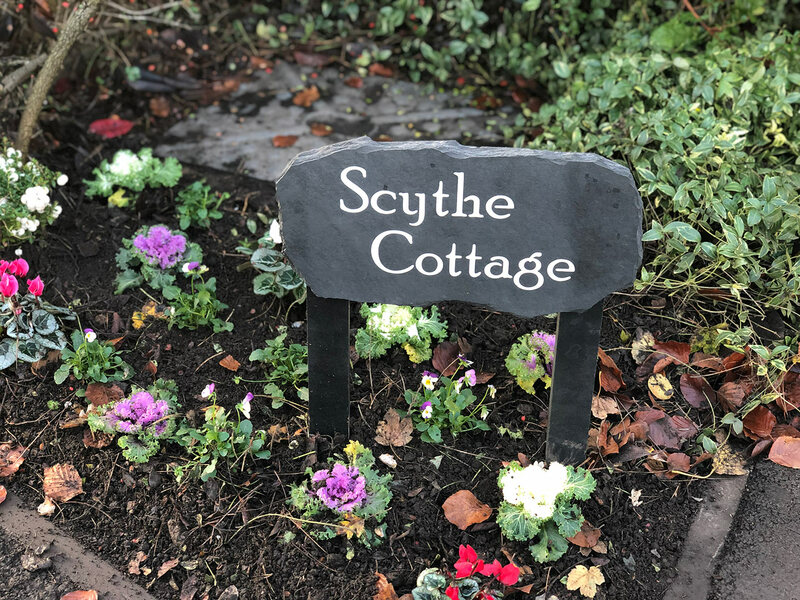 We wanted a house sign that fitted in with the real surroundings and nothing caught my eye until I came across Rustic Stone.I was able to add the image I wanted and choose from the many fonts, to create the perfect sign for us. A week later, it arrived very well packaged and takes pride of place on the wall of our home (we were supposed to wait till we’d painted the walls prior to putting it up -but we couldn’t wait!) Ive just taken delivery of a matching house number to compliment the house name and again it’s gone straight up on the wall! 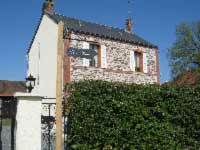 We promise that as soon as we have painted the house, I will send photos! Rustic Stone, the quality of each piece is better than we could have hoped for, many many thanks, and we’ll be back at some point for something else, I’m certain of that. The help with design was great and the finished article was delivered rapidly despite our remote location (according to the delivery companies). Bought a double side, hanging, slate house sign as a gift for a friend. The website design tool was easy to use. Friendly, helpful service and quick delivery of a really great quality sign at a sensible price. I was so impressed that I ordered two new signs for my own house which have just arrived. Also pleased to say that the friend loved her sign too. Ordered a house plague, it arrived within 2 weeks. Looks good, and excellent value for money. Above expectations. Would recommend this company. Great services, fast and the finish was amazing. Just wanted to thank you for the second house sign for The Spinney. The product is perfect like the last one, we are absolutely thrilled with it, and your service as always is excellent. Thank you for sending our house signs so quickly. They are perfect and I have attached photos of them in situ. Sign designed to our specification. Completed and delivered very quickly and on a date which suited us. Delivered safely and extremely happy with the quality of the stone and art work. Thank you Jeremy for a trouble free purchase and for a welcome addition to our homestead. House sign arrived today. Superb, thank you for your service and ease of ordering. Fantastic new house sign, delivered in time for us to move into our new home and Jeremy was very helpful with the design of it too. Thank you so much, it has finished off the front of our house perfectly. Just received my house plaque today, wonderful job! It looks really stunning it is exactly what we wanted, it will have pride of place next to our front door. I won’t hesitate to recommend you when visitors admire it, once again many thanks. Thank you very, very much. Hope to get them up this weekend, weather permitting. Photo will follow asap. Cheers ma deers. Great work. 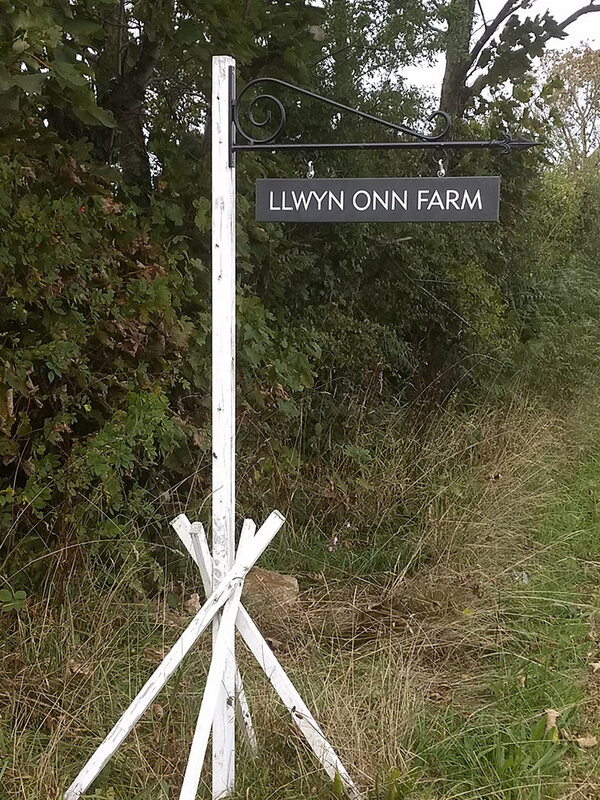 Thank you very much for sorting out and replacing the new fixing studs for our house signs. 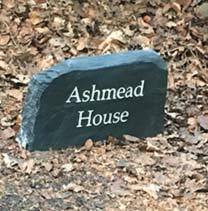 We are so delighted with our new house sign. I am delighted with it, exactly what I wanted, and made and delivered in the week before Xmas too! Thanks for your help in maK my design possible despite my lack of computer "savvy", an all round excellent service. Thank you for the brilliant service and wish you all the best for 2017. Just a quick note to thank you for sending the replacement house stone which was perfect. Fast delivery and extremely well packaged. Thank you! Delighted with our House plaque. Love the ease of designing your own. The house sign arrived safely this week and I just wanted to let you know how pleased we are with it. The mock up you sent did not do the finished piece justice. Having bought a house six months ago and then going through a 12 week renovation and build project, we wanted a new sign for our 'new' home. We wanted an image on it that would gently reflect its name, Windyridge, and decided on a dandelion. 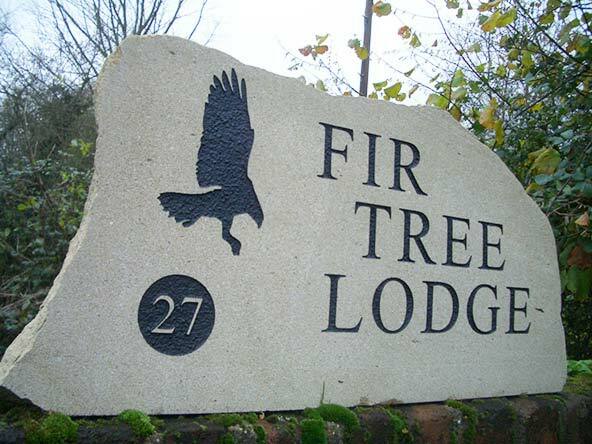 Rustic Stone worked with us to ensure that the image fitted within the size of sign we had chosen, and didn't look like a blob. 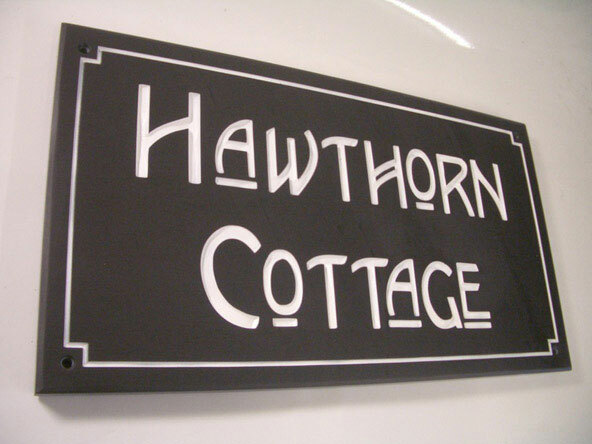 The completed sign arrived in good time, and our reborn house now has a lovely new name sign. We are delighted! 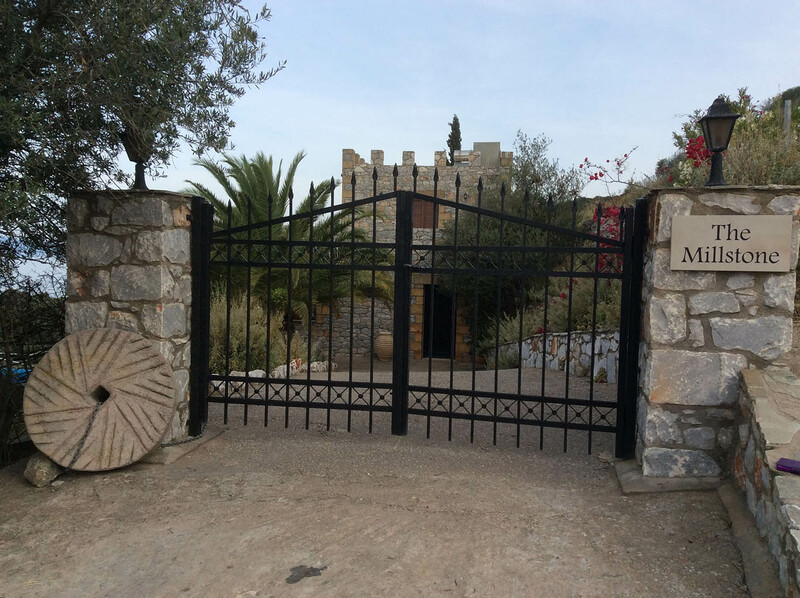 I have just returned from a holiday to our house in Greece where we fixed the beautiful name sign you made. The picture shows it in place and the Millstone I made of concrete out there. I would be delighted and honoured if you wish to use the photo for your own business and wish you well for the future. So pleased with the sign you have just made for our house. Delighted with the quality, well worth the money, thanks again. I have also passed on your website details to a friend who admired them and is looK for similar. I was extremely impressed with the website and the 'Design & See' before I placed my order. As promised, the first thing the next morning I received an email with the actual layout. I was even more delighted when it arrived within 2 weeks of placing the order. I am having a house warming/naming day at the end of the month, so I haven't put it up yet (it's going to be a surprise for my family). Many Many Thanks for the superb service you have provided and the quality of the finished product. Many thanks, and we'd definitely recommend this service! 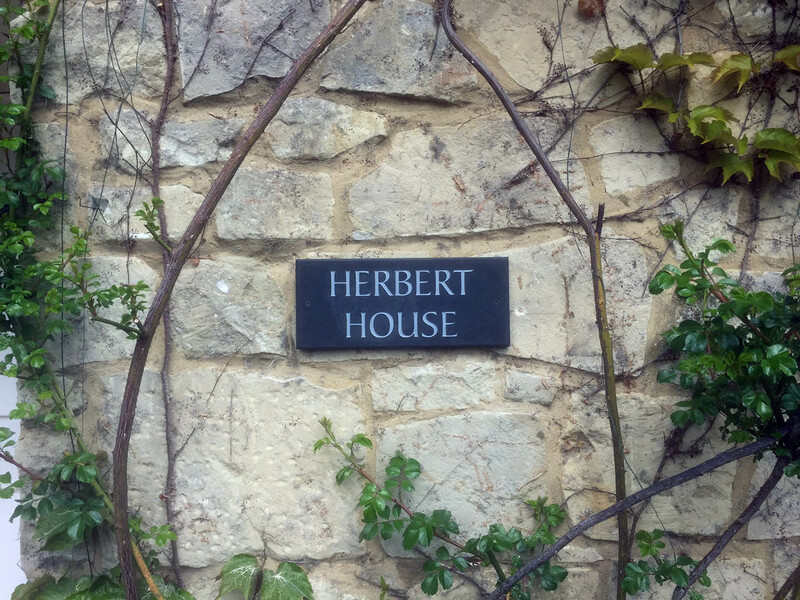 We're delighted with our very handsome new house sign. 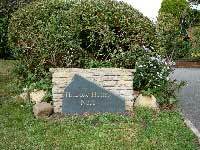 What's more, the service was excellent, and Rustic Stone were very easy to deal with. Grateful thanks for a job well executed. 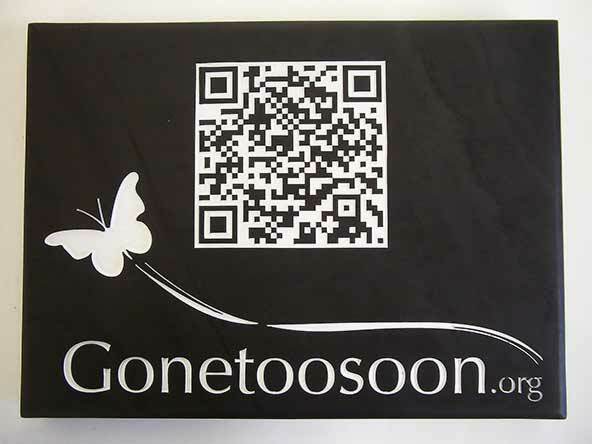 Great communication, excellent product and delivered safely and speedily. Thank you for excellent result and service. Only issue was that it fell on my foot when we were unwrapping it – hobbling but happy. Best wishes Stella and Alan Still. Received the stone, many thanks. Looks great. Many thanks for the sign. Thank you for your prompt service regarding the house sign which I gave to my Dad for his Christmas. He was delighted with it and it was quite amusing watching him unwrap all the bubble wrap! Thanks for getting it to us in time for our party! The house sign (Swallowfield) is absolutely stunning we couldn't be more pleased. I just wanted to let you know that my sister and brother-in-law are delighted with the stone and have commented on how lovely the engraving is. 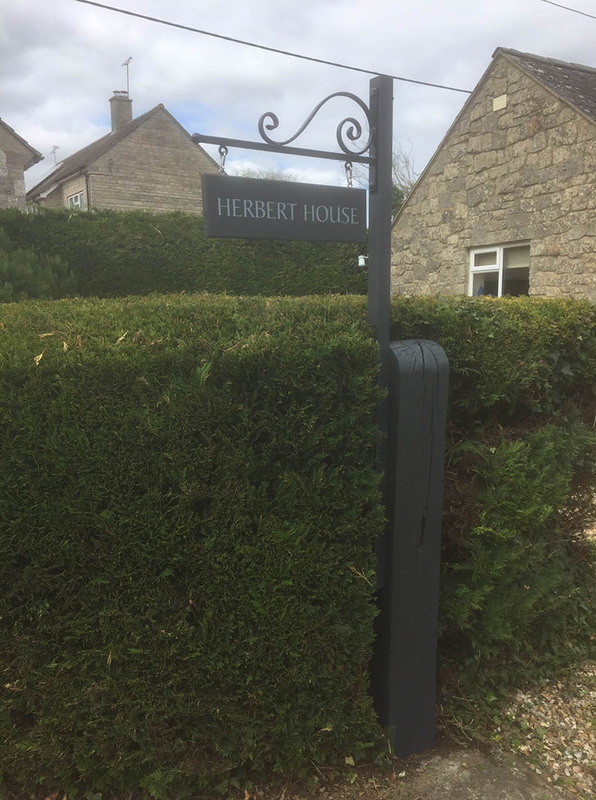 Over the last 8 years, we have had three house signs made, all in the same special font, for different locations on our house/drive. The very first sign ordered still looks as good as when it was delivered. Have no doubts at all in giving Rustic Stone 110% recommendation. Thanks for the signs that arrived today, they are simply awesome and superb quality. 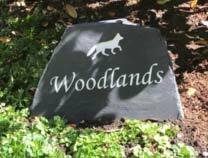 The stone engraving is very competitively priced and the customer support is second to none. 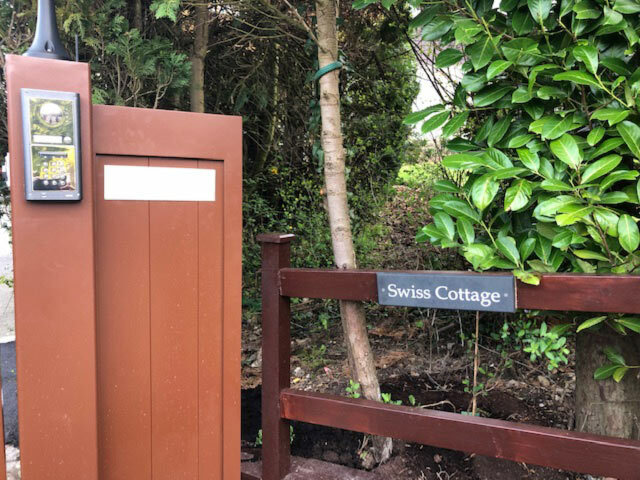 My sign looks wonderful and really puts that finishing touch to the front of the cottage. The mock-ups were very helpful and the personal touch to your responses made me feel that my custom was valued. Our plaque arrived on Tuesday and was put in place within 10 minutes of my boyfriend opening it… so pleased. It was exactly what we wanted and have received lots of admiring comments. It looks great and provided the final classy touch to our development. The plaque arrived today in good condition, extremely well wrapped and I'm very satisfied with it. We are very pleased with it. My parents are also very pleased with the house sign you made for them last year. 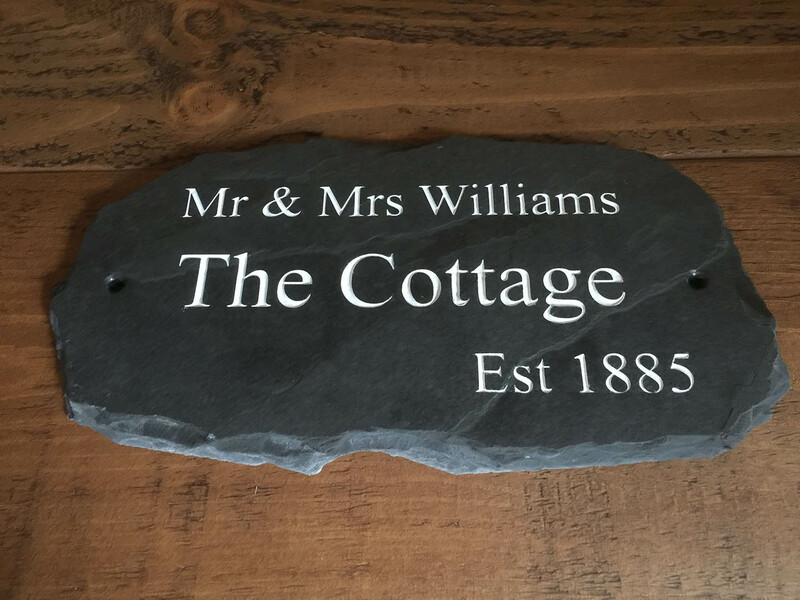 Many thanks for the beautiful slate sign you made for my mother she was over the moon with it, an excellent product with a helpful, efficient service… will definitely be passing on your details to anyone else looK for anything for the home or business in stone. 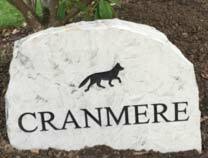 Thank you for delivering stone on Friday have placed it outside today and it looks great really pleased with it, its exactly what I wanted. 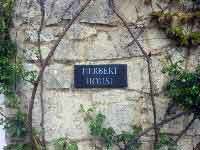 We put up the house number plaque and again your products look absolutely wonderful. It looks so individual and much classier than the mass market shop bought one we had originally. Well packed and we're really pleased with it. 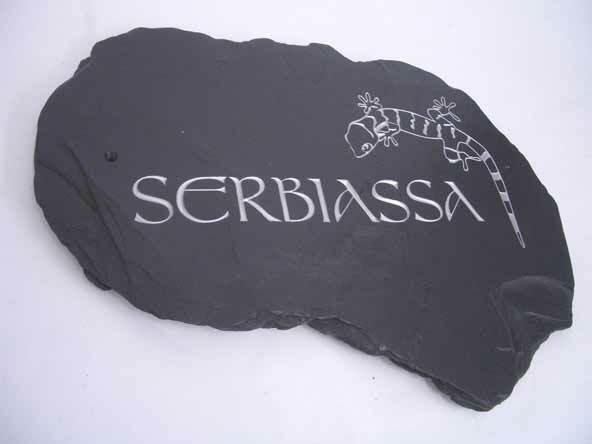 It's a lovely piece of slate and beautifully finished. Will be recommending your business to our friends and family. Just wanted to say, we are delighted with our sign. It was hung the day after receiving it. 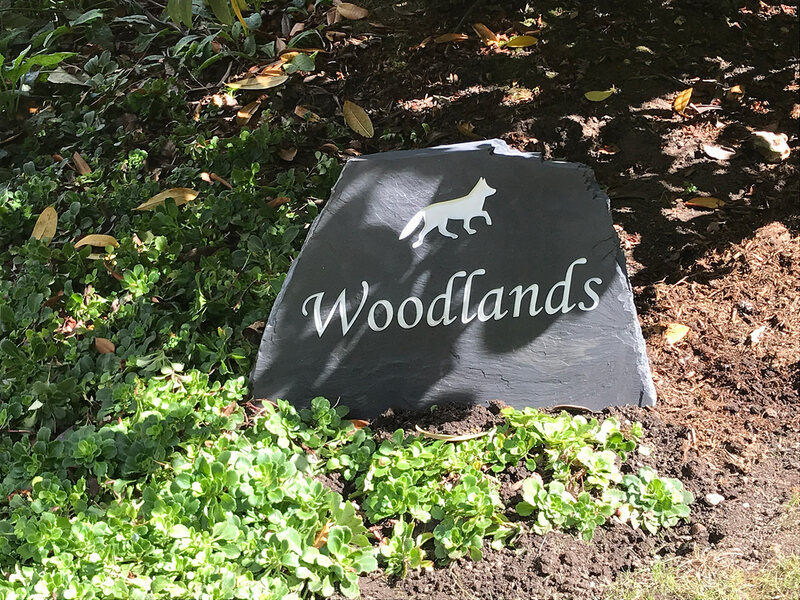 The stone sign arrived safely and is absolutely beautiful. It went to the Cardiff address for some reason, but my painter and decorator is coming back here next week and will pick it up to bring with him. 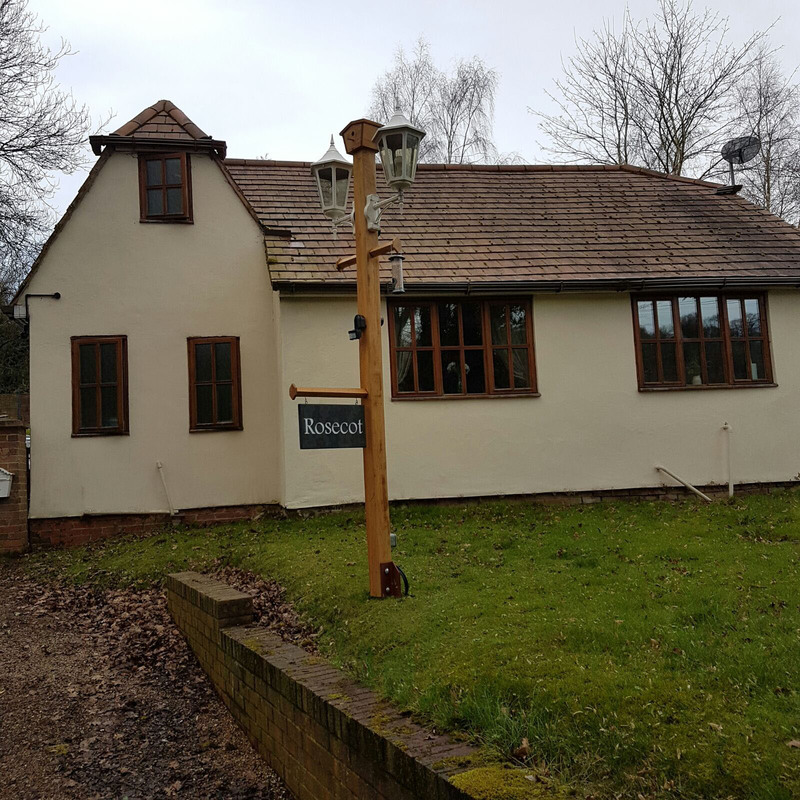 I will send you a photo for your website once it's up (sometime next week after the cottage has been painted) as we've just installed an oak porch and this will now complete a very impressive frontage. Finally got enough good weather to prepare the base and install the house sign. Attached are a couple of pictures. Just waiting for the grass to grow now!. The sign is fantastic and my wife was thrilled. I've got to say that the quality and 'design' of the slate way exceeded my expectations. Your service was exceptional and I can't thank you enough for turning it around so quickly before Christmas. It was with slight trepidation that I ordered the piece (Internet phobia !) 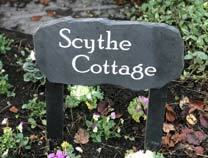 but I am delighted with the sign and with your help in choosing the right slate. 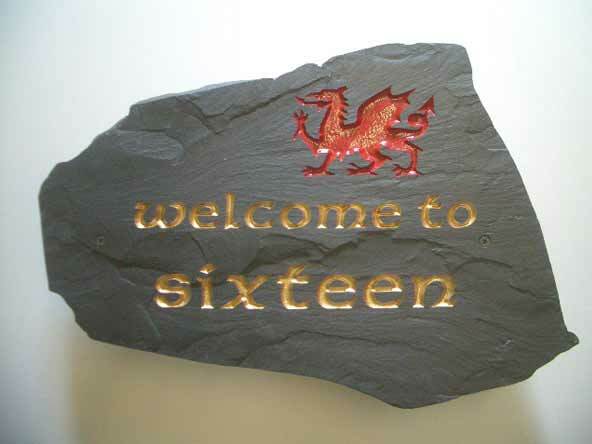 Just letting you know that the stone arrived safe and sound and that the customer is very happy with it. Just a quick note to say thanks for the stunning sign for Brookhill. 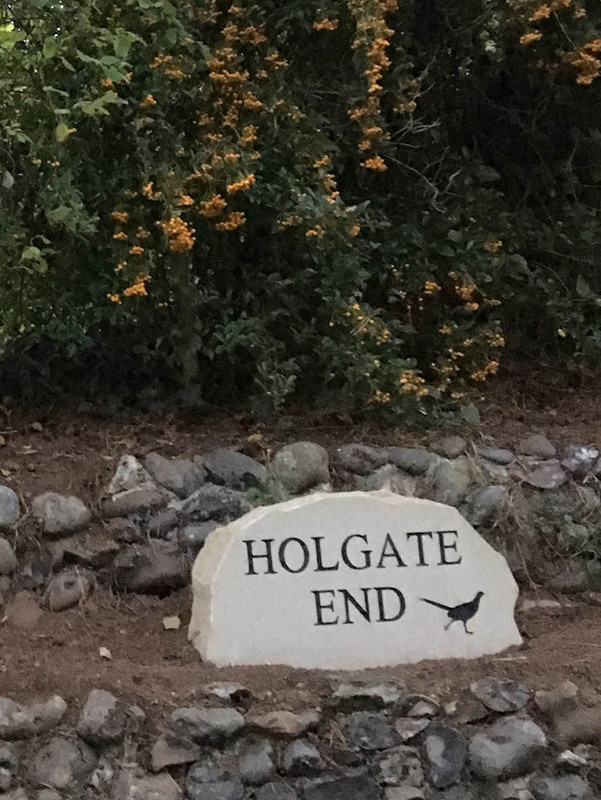 Mum is delighted with the sign for her new home and she had it in the back of the car before we put it up so she could show it to everyone she knew! It's beautifully finished and the Rustic Stone team should be proud, it's a top quality product. 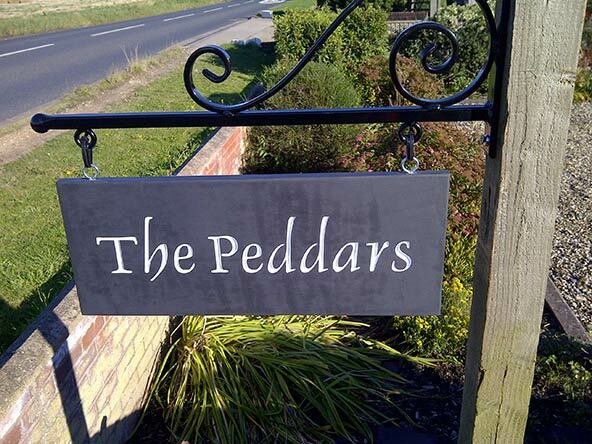 Our sign has been much admired and we think it has just the right feel for our home. A friendly font, simple and clear. The slate was much thicker than we expected, and the engraving was deep, so this is very much a quality product made with care. We chose a invisible fixture which proved easy and have added to the neatness of the sign. Many thanks for exceeding our expectations. It looks fab and exactly what I expected. It really looks the part, I am a happy chappy and my wife will love it. Just dropping you a line to say thanks for maK the sign for our new house. 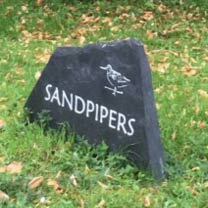 We are very pleased with the stone, it turned out beautiful. 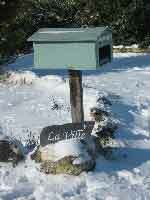 My husband likes it so much he refuses to put it outside, he has it sitting in his den next to his wood stove. It's exactly what we wanted and its just perfect! Just wanted to say thank you very much for the sign. It is lovely, thank you so much. It is perfect, really tasteful and simple. Thanks so much for my Bethany house name which arrived today. I am really pleased with it and wanted to thank you for doing such an excellent job. Just received the sign. Great. Very pleased. Thanks. We can't recommend you highly enough! The house name plaque you made for us is absolutely fantastic. The style and quality are perfect, head and shoulders above anything else that we came across in our lengthy search for the right type of thing for our house. It's perfect and we can't wait to put it up. So glad we found you – nearly gave up after our last experience. Will definitely recommend you to friends and family. Many many thanks for your prompt attention. Have now unwrapped it – WOW – that's a piece of slate!! Beautiful!. Unfortunately we don't have time to put it in place (safely!) this time due to the b….y awful weather – but at least it won't blow away. I will be putting photos on your website once we get back home tomorrow. Just to let you know that the stone arrived safely today and looks fantastic. We're both thrilled with it so thank you so much for a fantastic service. I just wanted to drop you a line to let you know that our order arrived safely and we are absolutely delighted with it! 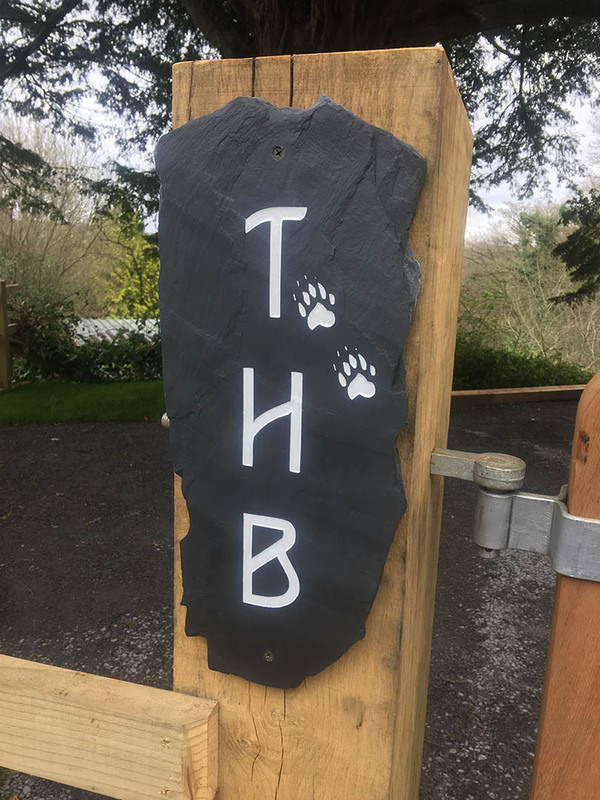 It's always a bit daunting ordering items on the Internet, especially when you're unsure of what the product will be like, but we are so pleased with the house plaque. It is a gift for my parent's 40th Anniversary and I know they will be thrilled with it. The house sign arrived early this morning and I am extremely pleased with it. Once fixed to the cottage it will probably attract some enquiries and, if so, I will certainly recommend you. A wee thank you for the taco my partner loved it and my baby loves the bubble rap! Hurrah! The Maus Haus has arrived in one piece and it is fantastic – I love it! 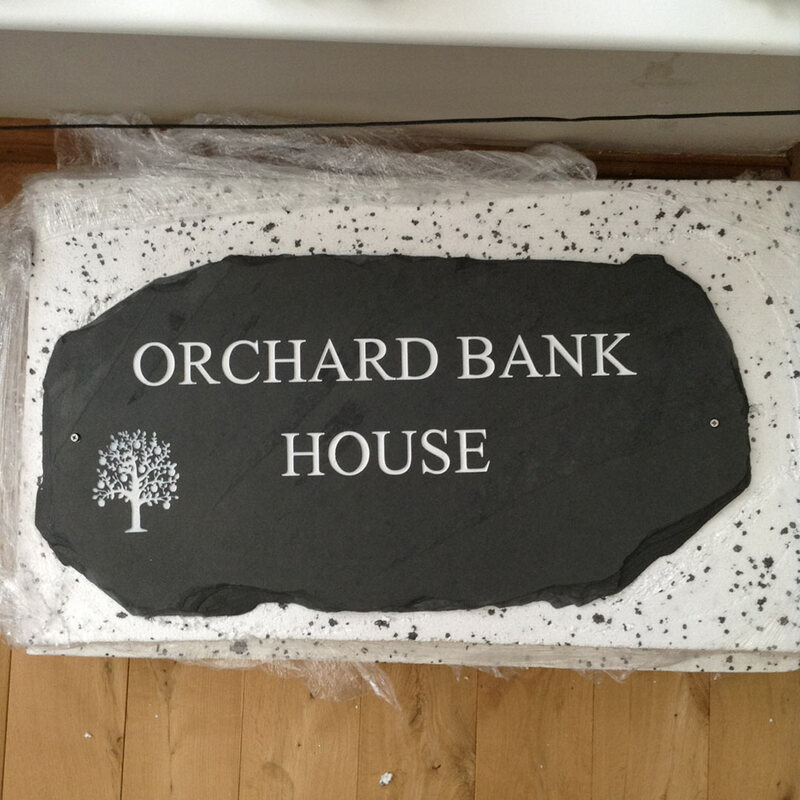 Thanks Rustic Stone for our wonderful house sign. 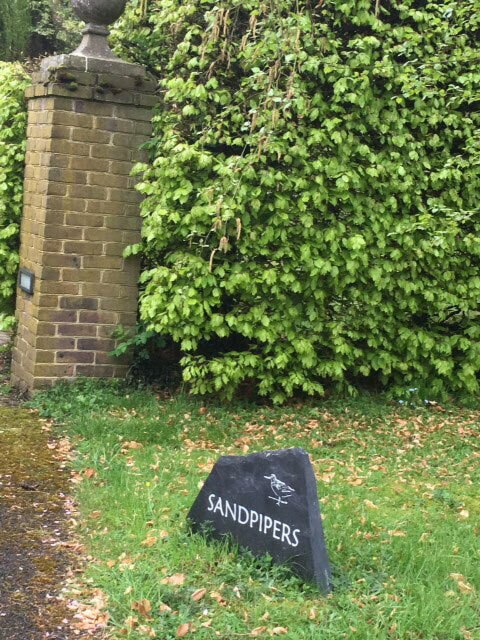 The delivery driver had a job finding us, as we didn't have a house sign up! Thought it was hilarious that he was delivering our new one! 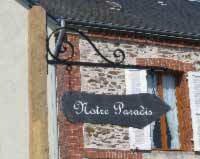 Attached is a pic of your handywork in situ in France! I just wanted to thank you for the beautiful “Springfield Farm” sign. 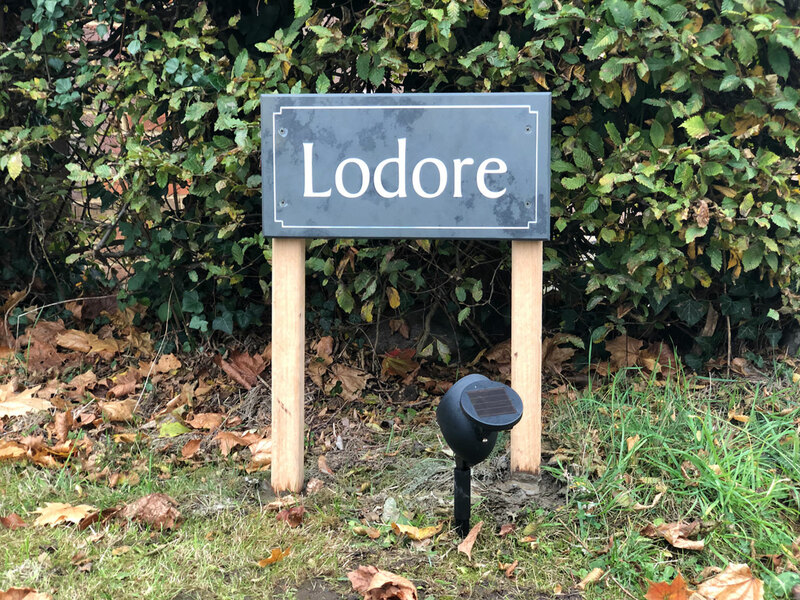 Just to let you know that my "Scarsdale" house sign arrived safely yesterday,and am delighted with it, and the speedy delivery after placing my order. Thank you so much. Just want to thank you for the sign you made for us, it looks brilliant on the outside of our new home. 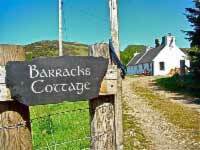 Very many thanks for the well packed, speedy delivery of this house sign for our wee 'But n Ben' at Glenelg on the West Coast of Scotland. Exactly what I had hoped for… chunky and rustic but clearly skillfully made! Incredibly heavy too… I love it! We received our sign today. We are extremely pleased with it, thank you. 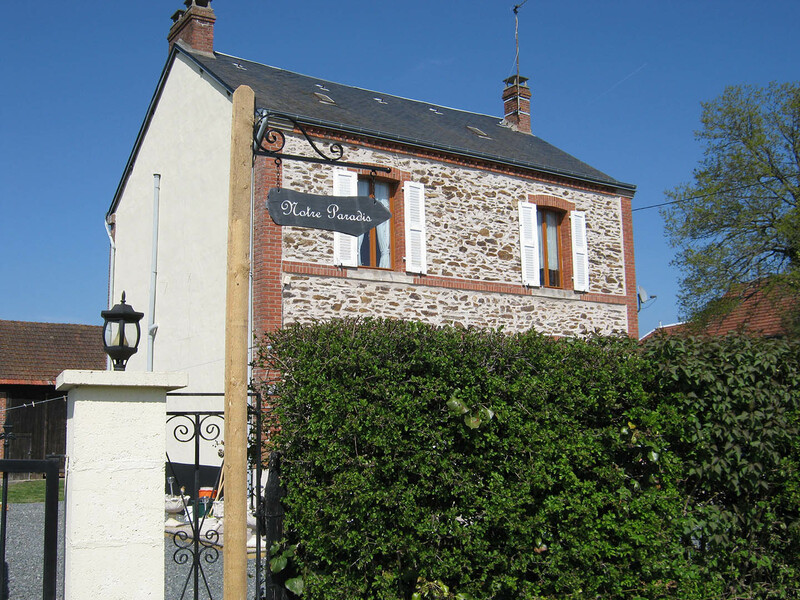 Great value for money, the perfect addition to our new home in France. I have submitted some images but note, it uses a temporary post which I intend to replace later with a nice piece of oak. 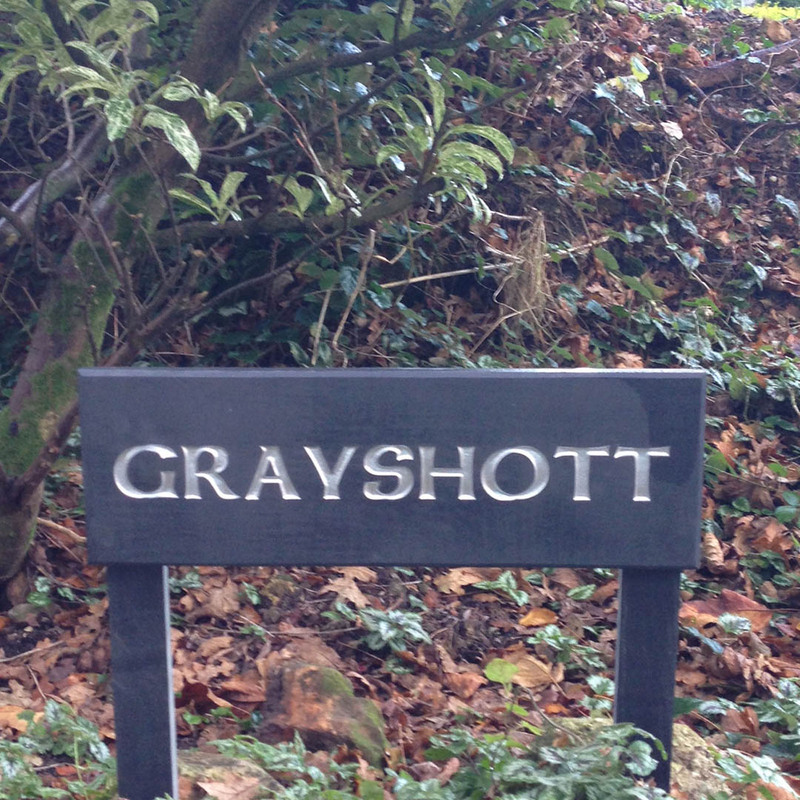 Just thought I would let you know that our Craigaol house sign arrived safely today & we're really pleased with it. The quality is fabulous and your service was second to none. Much appreciated and if I can refer business to you, I will. Just to let you know that the house sign arrived at my sons house in New Zealand in one piece and He and his Wife think it's Great. 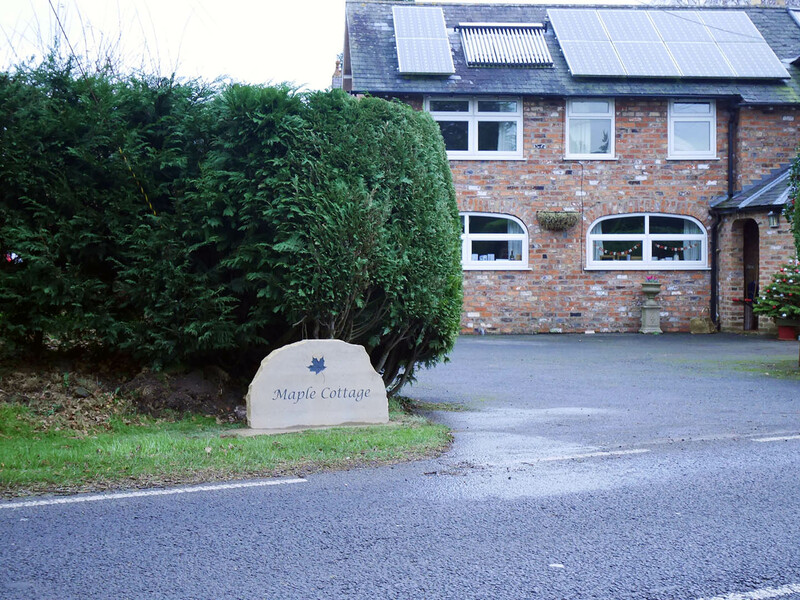 We received the house sign today – OMG we are delighted – thank you so much. 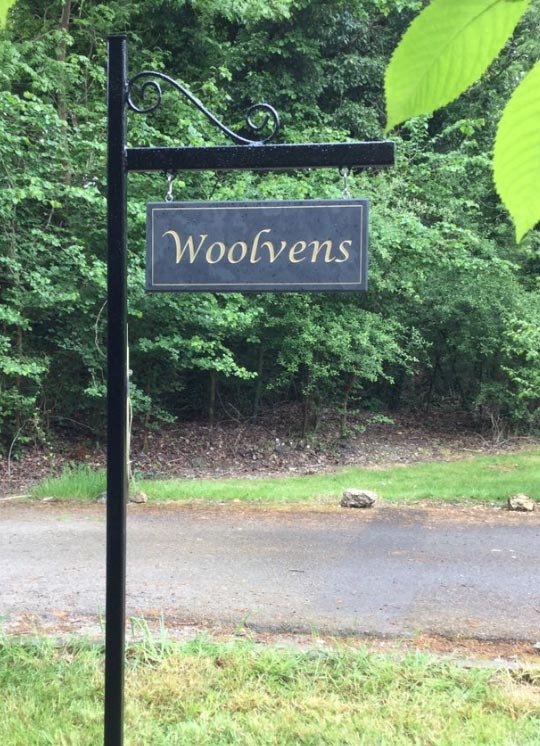 I just wanted to thank you for producing such a lovely house sign for us. This is a very much overdue thank you for the beautiful sigh you made for us. It's up on the wall now and my wife and I are over the moon with it. Rest assured that if we know of anyone who requires a sign we will not hesitate to recommend you. We're really pleased with them. Both signs have now arrived safely. Thank you very much for all your help on this. 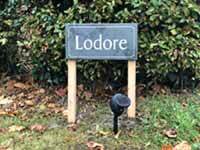 We were delighted with our house sign which arrived safely and very robustly packaged this morning. 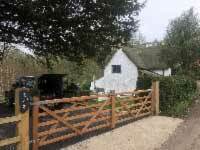 It is even better than we envisaged and will look perfect and the end of our lane. You are a true Master Stone Mason. a Craftsman of the highest order. Our stone has arrived safe and sound, and it looks amazing! It’s such a pleasure to receive something that looks so good and feels like such value for money. 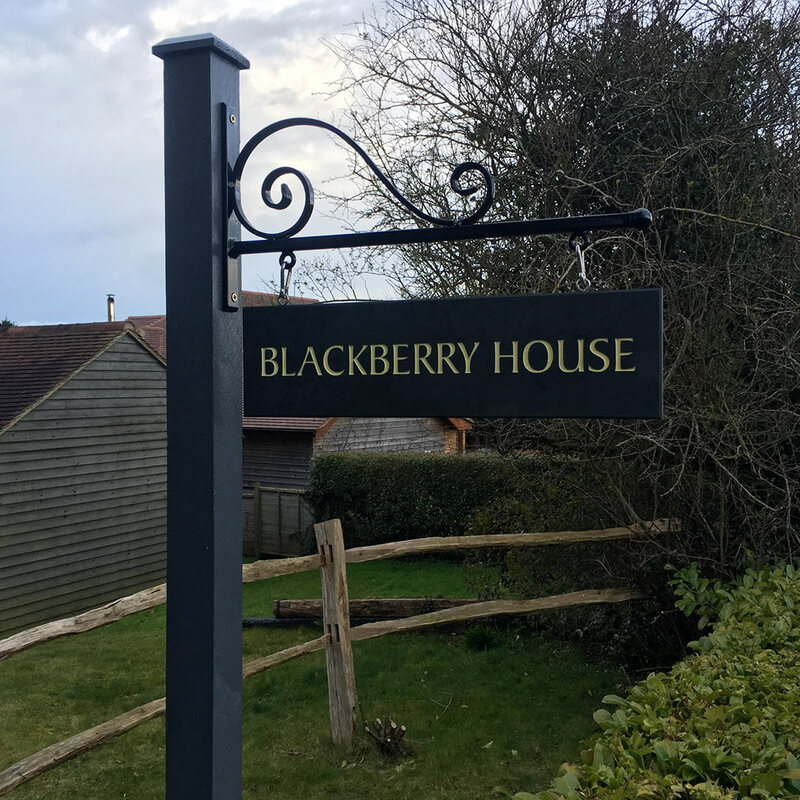 A very belated review to say we're delighted with the house sign, which we have now put up, and thank you for sending it when we asked (i.e when we returned from our holiday). I will be coming to youfor a house sign for myself when I purchase a new house. The replacement house sign arrived safely last Thursday and we are really pleased with it. My husband installed it in the front garden yesterday and it looks fabulous – our neighbours came round especially to say how nice it was! Thanks for the great service, we'll be back to order again in the future. I just wanted to let you know that the signs arrived SAFELY and well in timefor Christmas. They look AMAZING, we are very happy with them. 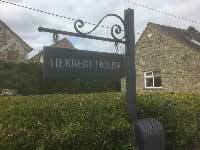 Just to let you know the house sign has arrived and looks very nice. Just wanted to let you know we received our sign yesterday and it is absolutely perfect. Thank you so much for all your help and your efforts in ensuring it arrived in time for Christmas. We have finally had the grass laid at the front of, (5 OTTER'S HOLT) and would like to thank you for all your help with the design and ordering. It looks so good and we are receiving lots of positive feedback. 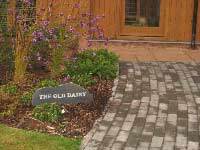 Our only regret, not being able to visualise the size of the grassed area before we ordered, is that we could have had a larger stone. Like the sign and more important so does the other half. I am most grateful to you for all aspects of the service that you have given: we are thrilled with the end-product and impressed by the speed with which the package arrived, even to these remote parts! I will have no hesitation in recommending Rustic Stone to anyone who's looK for the sort of thing you do. Everything about the ordering online was really straightforward and helpful, your own prompt and personal communication was much appreciated, and your generosity in the face of the slight mix-up (which was probably as much my doing as anyone's!) was a welcome change from the sort of service all too often encountered today: and, as I've said before, I'm most grateful to you for ensuring that the slate was ready and arrived within the relatively short-time scale which I'd requested. It's now easier to find our home! Thank you for your efficient service in providing us with a slate sign. It should help us to be found by delivery vans more easily in future! Very pleased with it, and looks perfect outside are property. Thank you very much, it looks absolutely lovely. Perfect. 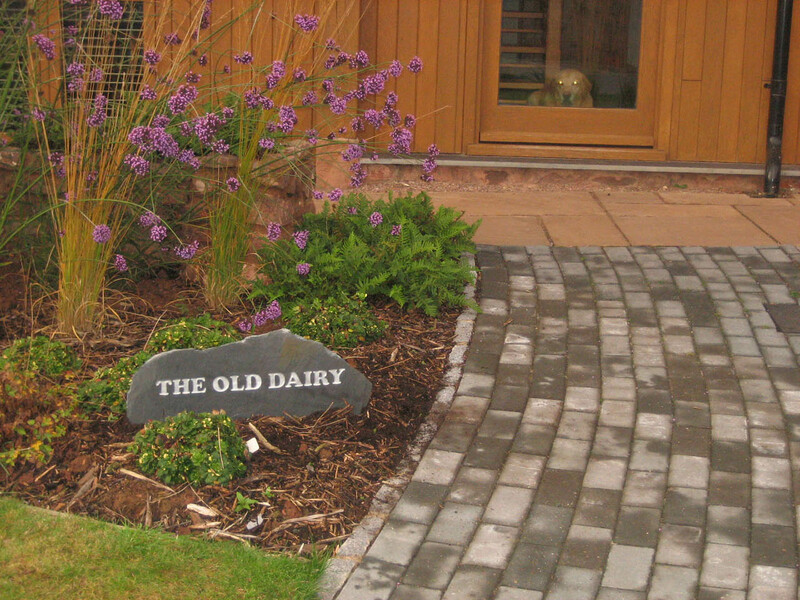 Rustic Stone's communication with the whole process was excellent and the sign arrived well packaged exactly on the day you said it would. 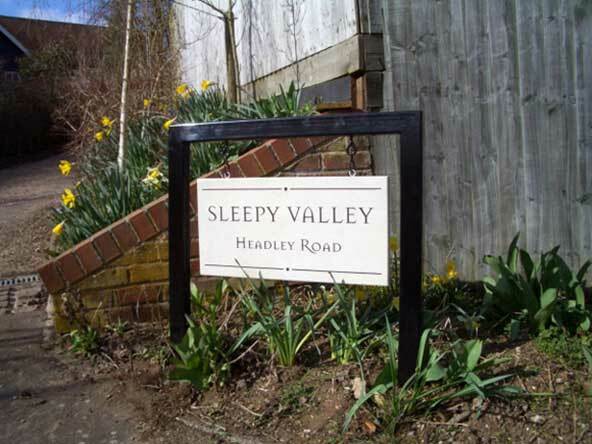 Hopefully, when my wife and I retire we will be looK for you to provide a house sign for us too. 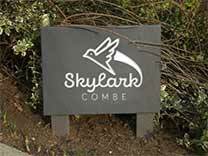 The slate sign arrived yesterday and it's BEAUTIFUL! I am so happy with it! Your skills and quality are amazing! Thank you – the slate arrived a few minutes ago and looks magnificent – also providing half the staff in the office much stress relief popping bubble wrap. I just wanted to say thank you for the slate sign. It looks lovely and I'm look forward to hanging it upby our door and starting a talK point with friends about its background. It's always a relief when a first-time experience with a newsupplier goes well. Our sign arrived today, it's perfect! 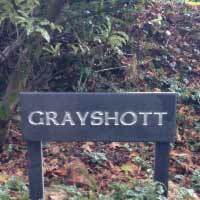 A belated but heartfelt thanks for the manner in which you handled our online request for the Oakhill house plaque. You adhered to your promise, delivered on time in January and the plaque was just perfect. It proved to be a very much appreciated gift by our son and daughter-in-law. 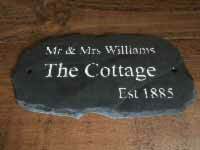 I just wanted to let you know that I gave Mum the engraved slate at the weekend. She absolutely loved it. She was really moved and I was really pleased to be able to give her something so beautifully made that meant so much to her. 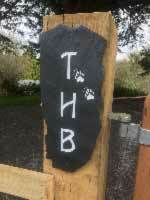 Received the free-standing stone sign, many thanks. Looks great. I am very happy with the House Sign, the Broadway Italic was exactly as I had imagined and it looks great!